I’m talking about “Storm-induced sea-ice breakup and the implications for ice extent” (Nature 509, 604–7), published online in Nature on 29 May, by A.L. Kohout, M.J. Williams, S.M. Dean and M.H. Meylan (KWDM). 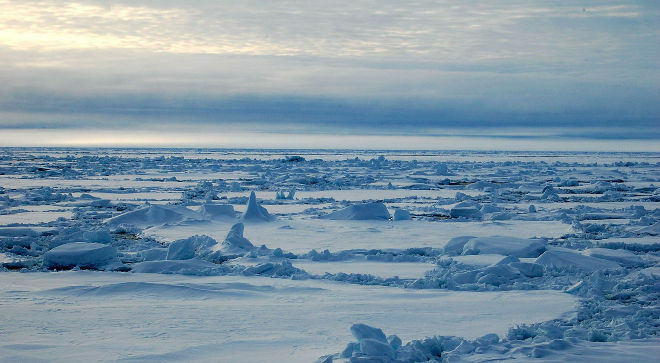 Its major discovery is that large waves travel much farther through pack ice than hitherto realised, thus breaking up much more ice than we realised and allowing it to be swept away by wind and wave—it hasn’t been melting from the heat of global warming. This finding neutralises the gaunt-faced despair and repugnance that’s been so widespread since the fall in Arctic summer ice in 2007, because nature caused it—not we with our selfish emissions. Here’s NIWA’s announcement of a few days ago describing the paper. It has a strong Kiwi connection, with (I understand) three Kiwi-based scientists, including the lead author, Dr Alison Kohout, a hydrodynamics scientist working for NIWA. In my first (hurried) mention of the paper I described it as ‘anti-alarmist’ because it seemed to destroy a strongly-held tenet of warmism and though it’s not that simple I’m still encouraged by its neutrality. Perhaps it’s luke-warm, because it avoids the avidly warmist pronouncements of other papers, yet it still trips itself on what I would call residual expectations of warming. They should have noticed by now the widespread acceptance of a lack of evidence to support the dangerous AGW theory. But we can be thankful the authors don’t hector us to reduce emissions, as so many authors have done these last 15 years. Climate Central has a story on it and Skeptical Science gives it a brief mention. The paper is behind a paywall, but ReadCube (it’s brilliant!) gives limited access for a small fee. The purpose of the study, carried out on board the Aurora Australis in the southern spring of 2012, was to measure for the first time how storm-generated waves propagate through sea ice. Five buoys fitted with wave movement sensors were dropped on ice floes off Antarctica and tracked as all five measured wave accelerations simultaneously for 34 minutes in every three hours with the data retrieved by satellite until transmissions ended after several weeks. The scientists focused on waves over three metres high, able to transport enough energy to break sea ice many kilometres from the open sea. On one occasion three-metre waves were measured 240 km from the ice edge—much farther than predicted by the commonly assumed exponential decay. The larger the wave, the better for breaking ice far from the edge. Now, Hemi tells me that storms are more likely to cause short, confused seas rather than large wave sets, which are a function of fetch and wind strength, which raises the interesting question of what sort of waves Dr Kohout was studying—storm or ‘rogue’. Hemi says that to build the huge 14-second waves that occasionally hit the south-west of New Zealand, and presumably the sea ice and ice shelves, requires a wave-set to be amplified by a continuous gale-force wind from directly behind over a distance of several thousand kilometres of uninterrupted water in a straight line. I don’t intend to compare the wave heights generated by storms with the less frequent ‘rogue’ waves, though it might be interesting. Suffice it to say that the three waves of furthest penetration recorded here may have been ‘monster’ waves resulting from persistent gales over huge distances rather than from discrete storms—regardless of the paper’s title. These results, the authors say, will help to improve the accuracy of climate models, which currently “fail to capture recent changes in sea ice”—surely just a polite way of saying everyone’s surprised by the large reductions in Arctic summer ice in recent years, its subsequent recovery and the concomitant 30-year increase in Antarctic winter sea ice, contrary to predictions. I predict that this paper will, once and for all, remove warming from an iconic piece of global warming alarmism—the disappearance of sea ice from the Arctic. Apparently, models are only beginning to consider wave/sea-ice interactions. Considering the importance placed on the polar regions as both drivers of global climate and casualties of man-made warming, I imagined these interactions were already understood and included in the models. Shows how much I know. A couple of statements struck me as a bit odd. Our results suggest that sea ice is vulnerable to changes in storminess. Yet the ability of waves to break sea ice has been known since the ‘heroic age’ of polar exploration. Waves propagating through sea ice leave behind a wake of broken ice floes, which are then more easily deformed by winds and currents, effectively eliminating the barrier between air and ocean and enhancing heat exchange. Seems sea ice is vulnerable. No surprises there. Then there’s this observation. However, the response has not been purely zonal; recent trends in the surface pressure pattern and winds have exhibited zonally asymmetric changes, resulting in variability in the atmospheric forcing of sea ice. This seems to say that winds pushed the sea ice around differently in various places, which sounds just like normal weather, doesn’t it? Still, the study they cite uses actual observations (by satellite from 1992 to 2010), which inspires confidence. I dare say you could ask almost any hydrodynamicist whether, in a large, complex weather system, wave heights might change “non-zonally” and the answer’s likely to be “naturally.” But I’d only be guessing. Finally, lurking among the professional scientific phrases of this new paper are what seem like actual errors. The observed southward shift in the storm tracks over recent decades has resulted in fewer cyclones at mid latitudes and more cyclones at higher latitudes. KWDM cites the WG1 report (The Physical Science Basis) of the AR5, wherein, in section 2.6.4 Extratropical Storms (p 217), it actually says that the southward shift has possibly (though they use the word ‘likely’, meaning they’re uncertain) resulted in more cyclones nearer the poles. The IPCC is also uncertain whether cyclones have become more frequent or intense since 1950, defying the widely expressed view that extreme weather has become more common. In the future, wave heights are predicted to increase everywhere at the sea-ice edge in the Arctic and Antarctic. It is conceivable that this will act to accelerate sea-ice retreat. As the source of this prediction, KWDM cites Dobrynin, Murawsky and Yang (2012), Evolution of the global wind wave climate in CMIP5 experiments, Geophysical Research Letters, Vol 39, Issue 18 (DMY). In fact, we don’t know the effect of warming on wave height. Recent papers claim wave heights will go both ways — some will be taller, while waves in other regions will be smaller. The abstract for DMY clearly states: “We conclude that projected wave heights are still within natural variability.” Which means they don’t predict an increase—since the minimum possible increase must exceed natural variability. So KWDM is wrong. It’s doubtful they mean the prediction itself will take place in the future, since the correct conjugation in that case would have been “will be predicted.” There’s a strange ambiguity to “everywhere at the sea-ice edge” but it signifies nothing. With the uncertainty so clearly stated, there’s no foundation for Miss Kohout and cohort to claim that global warming will only increase, and not decrease, wave height. Because the evidence is that it will make waves behave as they already do: vary around their natural mean. The paper presents knowledge of some fundamental behaviour of storm waves moving through pack ice, though it has flaws. The authors make loose attempts to link the waves and their effects with global warming, though it’s implausible. There’s no evidence that warming influences significant wave height, though the suggestion of a warming effect from sea ice reduction is certainly feasible. It would be useful to quantify this. How much warming could be expected from the loss of, say, 500,000 square kilometres of sea ice? In the Antarctic, very little or none, since the sea ice only exists when the sun is largely below the horizon. Though there may be minor, short-lived warming during spring and autumn when the sea ice is melting and freezing. In the Arctic, again, there’d be no warming in the winter, but in summer one could expect somewhat stronger ocean warming than in the Antarctic. Insolation is the only source of surface warming. There’s no mechanism for significant radiative or conductive warming from the atmosphere. Even during summer, the extra warming would be small because the sun’s rays strike the surface at shallow angles. Interesting research and surprisingly, considering the source, evenhanded. Seems to fit with the old ‘Mariners’ tales’ spawned by polar exploration from the era that first made ‘adventure’ books popular. And to this should be added the recent ‘discovery’ that the volcanoes below West Antarctica could cause some local heating and melting there. Good to see some more balanced research being published. I think I detect a climate of change in published material. Yes, it’s happening all over the place. 5 years planetary heat storage (decade max) would be at odds with just about everyone else thermodynamically if he is referring to a sun => ocean => atm system where heat storage is obviously the ocean and much much longer than 5 years (i.e. 11 yr solar cycles aren’t the driver of planetary heat). It would be premature though (as Willis Eschenbach does at #26), to throw this model out already without seeing where it goes in terms of cycles longer than 11 years (in other words, over a series of consecutive 11 yr notches). I agree with Willis regarding one single 11 yr cycle however that ∆F does not equate to ∆T. David Evans solar model doesn’t really fit with Robin’s “a climate of change in published material” in terms of the nature of the material I have to say (not referring to the published aspect here). I think any “climate of change in published material” in respect to CO2-centric organizations like NIWA is a situation that has been forced upon them by the non-response of the climate to rising CO2 levels. If you can’t make clear links between CO2 and climate phenomena then you have to go study something else and publish that. The IPCC uses tricks that scientists and statisticians rage about, almost like a mimicking of the classic text, How to Lie with Statistics. For example, the IPCC claims “90 percent certainty” in its attribution of most of the warming of the past 50 years to human causes. All scientists know that using this phrase implies that a statistical test has been performed on random data, leaving only a ten percent chance that the conclusion is incorrect. But there is no testing, and there are no statistics, involved in the IPCC’s statement — just a number pulled from thin air. ‘Diverging’ indeed. Obviously his fellowship had to be ‘terminated’.